Coron, Phillipines has been on my radar for ages because it is a prime diving destination. In 1944, American war planes bombed and sunk a fleet of Japanese war ships in Coron Bay. Since then, these Japanese tankers have rested at the bottom of the ocean. I've dived shipwrecks in Florida and Thailand, so I was excited to see another piece of history underneath the ocean's surface. I chose to dive with Reggae Dive Center (RDC) based on a friend's recommendation. They were really busy, so I was lucky to even get a spot on one of their dive boats. After grabbing breakfast at the hostel, the dive center was only a 10 minute walk away. I showed up at 7:15am to get fitted for gear and by 8am, all the oxygen tanks and gear had been loaded into a Jeepney and we were shuttled to the pier. It looked like RDC had three boats well-equipped for diving. They had split everyone into groups, so those who were doing their certifications were in other boats and people who were doing fun dives, like me, were in a separate boat. Once on board, there were only seven of us diving, so it was nice not to have a crowded boat. The group was further split in two, so there were four of us in one group, plus our Dive Master. I got to know the rest of the divers pretty quickly, and we set off for Barracuda Lake as our first dive site. I had actually been to Barracuda Lake the day before on the island hopping tour. It's a unique dive because there are different thermoclines due to the salt and fresh water mixing, so the water temperature is anywhere from 85-100F! It's like a jacuzzi. Excited to get my first dive in, I got in the water with my gear and GoPro. Here is where my day started to go downhill. Once we finally climbed up and over the many steps to the lake, I went to put my mask on and... it wasn't there! I felt like an idiot. As a diver, you always keep your mask around your neck; you're not supposed to keep it on your head because it can easily slip off. Honestly, I think I was so distracted trying to turn my GoPro on and off, that I lost track of my mask. My Dive Master and I had to ditch our gear, climb back over the steps, and frantically look for my mask. Luckily, another boat had fished it out of the water. This pushed our diving start time back, and the rest of the group had to wait for us. Losing my mask was a rookie mistake that I was definitely embarrassed about, but never again -- I learned my lesson! So, we're finally ready to descend into Barracuda Lake: 5 feet... 10 feet... 15 feet... And for the first time ever since I've started diving, I had ear problems. I couldn't get my ears to equalize, which is necessary in order to keep descending. Otherwise, the pressure builds up in your ears and it's impossible to descend further. It's like being in an airplane and not being able to pop your ears. I couldn't get past 15 feet without feeling pain, and after working with the Dive Master to try to equalize, I finally had to ascend by myself as the rest of the group went on without me. I climbed back onto the pier, ditched my diving gear, and sat on a rock for 45 minutes as I watched a huge tour group of Koreans go snorkeling. So, that was my first "dive" of the day. On the second dive, which was a shipwreck, I decided to try again. We were diving the Olympia Maru, a beast of a ship at 416 feet long and weighing over 5,000 tons. The ship sits upright at a depth of 90 feet / 30 meters (that's the recreational diving limit). As we went through the dive briefing, our Dive Master asked, "Okay, who wants to go in the wreck?!" Three of us said, "Yeah!" while I was like, "...What?" I like looking at shipwrecks from the outside. I hate going inside them. Just like I hate elevators, haunted houses, and even bathroom doors with janky locks because what if I get stuck and can't get out?! I didn't even know Advanced divers were allowed to penetrate shipwrecks; I thought you had to get some kind of special Wreck or Technical diving certification in order to do that (also, I still giggle at the word penetrate; I am a child). Penetrating wrecks carry a host of hazards, from getting disoriented, getting tangled in cable cords, getting lost due to lack of light, or getting cut due to sharp edges. The main hazard is that being inside a wreck prevents direct access to the ocean's surface -- my claustrophobia was already setting in! I had to say something. "Um, I'm a claustrophobic person in real life. Like, when I'm in an elevator with plenty of oxygen around me. My claustrophobia is going to go through the roof when I am 90 feet below the surface hooked up to an oxygen tank," I said. "I don't think I can do this dive." My Dive Master assured me that things would be okay: "Don't worry. Nothing to be scared of!" I hesitated and was full of anxiety, but I also didn't want to miss out on another dive when I had already had problems on the first dive. So I went. I descended slowly on the anchor line, and didn't have any problem equalizing my ears (phew!). The shipwreck loomed before us -- my favorite part of a wreck dive is when you can't see the ship at first, and then all of a sudden the it is right in front of you. I loved seeing the coral growing on the hull of the ship and the many fish that now called this place home. At one point, the Dive Master beckoned for us to enter a room. The entrance was rather large, like a door, but I signaled, "No." The rest of the group went in and I waited outside, happy to be looking at all the marine life outside of the ship. Once the group came back out, we started diving a bit deeper. The Dive Master took my hand and we started descending into the ship's hull. The space was large, but I could see the light dissipating. I could tell we were in some kind of engine room. The Dive Master took his flashlight out and I could see a lot of crushed oil barrels. He beckoned the group to go through another opening; I waited for the rest of the group to go before I went through and the Dive Master made sure my oxygen tank didn't hit the sides. This was when I felt my claustrophobia set in. The room was still large, but I couldn't tell if we were in an enclosed room with light flooding through or if the ocean surface was above us. The visibility wasn't that great, and the simple notion that there may be a roof above me had me panicking. I had to keep reminding myself in my head that I was okay, that the worst thing to do while diving was to panic, and that my life wasn't in any danger (kind of). I was still holding my Dive Master's hand -- I literally think my hand was sweating, even underwater! -- and I breathed a huge sigh of relief when I could finally tell that we were outside the shipwreck again. After a forty minute dive, we ascended shortly after. While I was grateful I had done the dive, it's not something that I would ever do again. I know my limits as a diver and that is definitely one of them. I ended up skipping the third dive because I had a flight 18 hours later (you need to wait 18-24 hours after a deep dive to fly because of the change in pressure), but I didn't mind because the group was going to penetrate another shipwreck. After the dive, the group told me that the spaces were very small, it was very dark, and there were multiple times when the only way out was to move in one direction. Helllll no. I will take an elevator any day over being in a sunken shipwreck! So, what was supposed to be a full day of diving ended up being one dive, a lost mask, and a lot of anxiety. 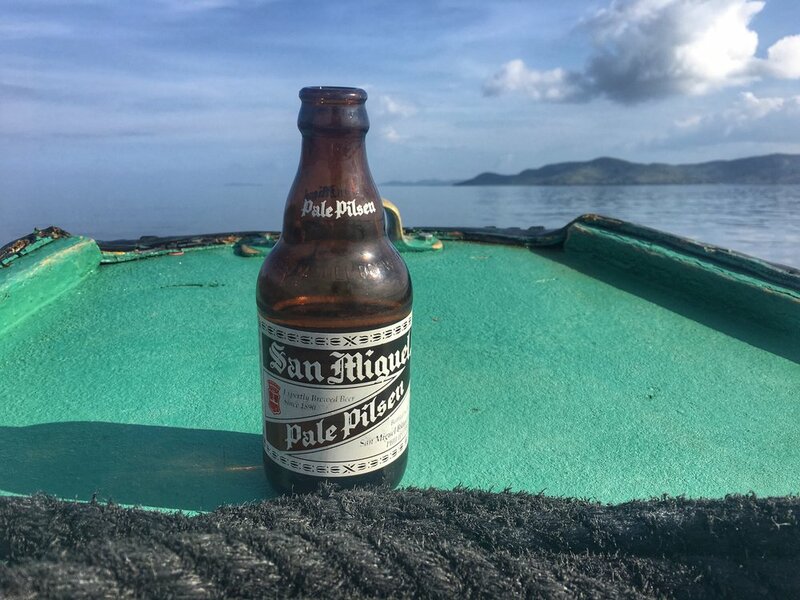 On the plus side, we each had a beer as we disassembled our gear and put everything away, then enjoyed the hour-long boat ride back to Coron. The ride back was incredible; the sea was like glass and the islands looked like a scene straight out of Avatar! I had a headache from the day, but it cleared up as we got back into town. Once I paid for my dive (which unfortunately was pretty expensive, since it gets cheaper per dive with each dive you add on), one of the guys I met at the beginning of the day was wrapping up his Advanced OW Certification. He mentioned he was going to catch the sunset from a rooftop restaurant, so we decided to go together. We didn't even get each other's names until we sat down to order -- that's the funny thing about travel, sometimes. 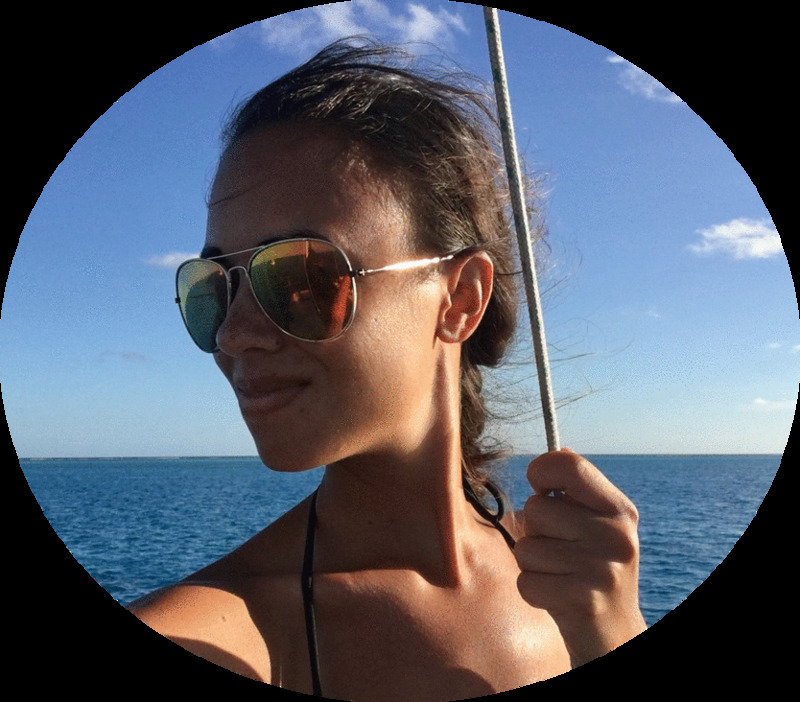 You've already got something in common: you're traveling and, in this case, scuba diving, so it's easy to just connect with people. After a great sunset with good food and a helping of gelato, we parted ways. I was exhausted and my two days in Coron had come to an end. It wasn't exactly the diving expedition I thought it would be, but the island hopping and incredible people I met more than made up for it.